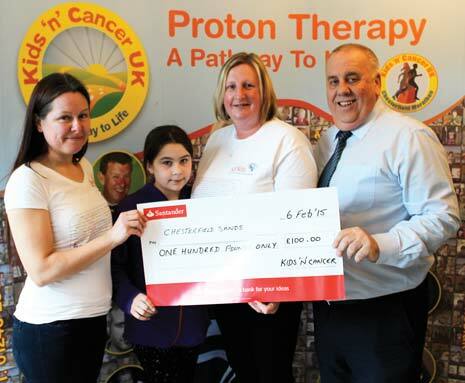 Over three thousand pounds has been donated to local good causes from funds raised by the inaugural Kids 'n' Cancer Chesterfield and Derbyshire Marathon. 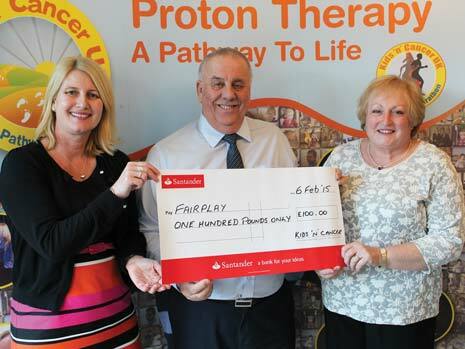 Many local charities will each receive a sum of £100 from organisers of the event - staged on September 14th 2014. 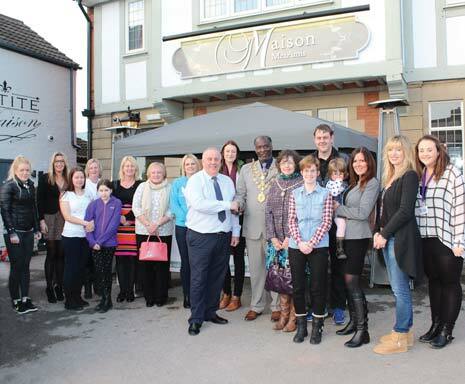 Chesterfield Samaritans, Fairplay, Ashgate Hospice, Pathways, Helen's Trust, Sick Children's Trust, Chesterfield Sands and The Mayor's Appeal gathered at Maison Mes Amis on Chatsworth Road on Friday afternoon (above), where they were presented with cheques by Marathon CEO Mike Hyman. Further presentations will be staged for other charities later. Peter Gately (below), from Chesterfield Samaritans, said he was delighted with the donation, "It adds to the contribution that we get from various sources and it's very welcome! We are moving premises soon and everything will be needed to help with the cost that so we are very grateful to receive any donation from anywhere! "Chesterfield Samaritans have been in existence in Chesterfield for many years and all the volunteers donate their time to help people in despair - 24 hours a day. Whenever you ring a Samaritan number, someone is always there to listen and spend as much time as possible to talk over your problems and try to make you feel better at the end of it. The number to call is 08457 909090." 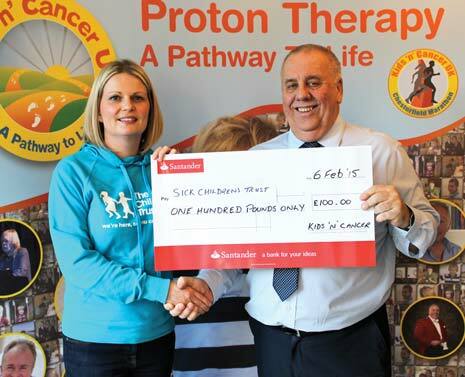 Another recipient, Nicky Whelan (below), of Chesterfield Sands said she too was pleased to be receiving a cheque, "Every penny counts for us. We're only a small local charity, even though we're part of a large national charity, we don't get funding from them, so to run the group to help and support families in the area, we need to raise money. "This means the world to us. We did the Team Relay and someone doing the Marathon and Half Marathon - and it was a fantastic day- we loved it and we raised money. A few months later, we had a call to say this money was to be donated, we didn't expect it so we are delighted and thrilled with it. "Chesterfield Sands has been going nearly four years and we support families who have lost babies during pregnancy and shortly after birth. There's nothing given to families as they leave hospital with empty arms - they're on their own and we try to help families as much as we can. 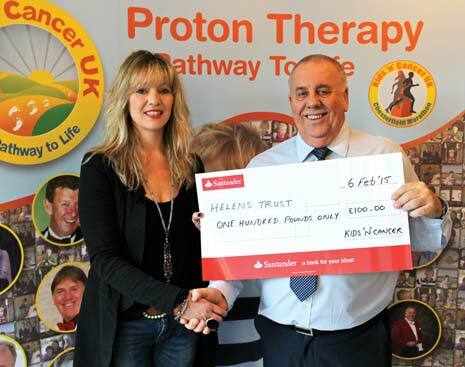 "We've had two baby gardens built, one is Boythorpe Baby Garden at Boythorpe Cemetery - we raised £25,000 for that! It was amazing and beautiful and will be a year old in June. It's a lovely place, somewhere families can go if they don't want to come to a support group but want time on their own - they can go there. "Anyone can contact the charity by social media and the website. We support families by telephone and face to face and support groups which are the first Tuesday of every month." Andrea Hooley, Events Director for the Marathon and Kids 'n' Cancer said, "Today, the Chesterfield and Derbyshire Marathon team is donating to local good causes from the proceeds from the marathon last year. They're all local charities, eight in total today and then more presentations spread out. There's another Marathon planned for this year - Sunday 20th September - and we hope it will be even bigger and better!" Charity Founder and CEO Milke Hyman said, "This is what the Marathon is all about - Chesterfield, Derbyshire and helping local charities and community. 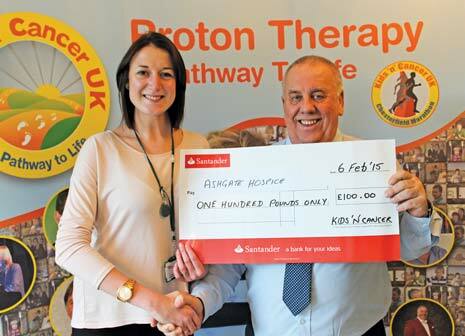 Yes, Kids 'n' Cancer is the driving force behind the event - but we are hoping to establish a tradition of fundraising here. 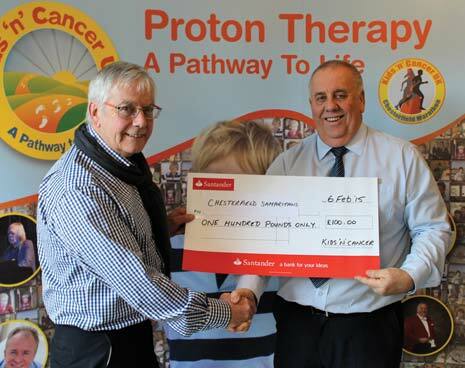 "Any local charity or community group can now receive a share of monies raised from the Marathon every year, either by application direct to the Charity or by getting involved with our new Marathon Volunteer Share Scheme. This is where any person coming from a charity or community group to help out at the Marathon as a volunteer in any capacity, will earn a volunteer 'share' for that group. The funds raised through that year's Marathon will then be divided equally between all shares, so a group supplying us with one volunteer would get 1 share or 10 volunteers would get 10 shares of the funds raised. It means we everyone can get involved in what we see as a wholly inclusive event for the community in Chesterfield. "Today though, has been about our first presentations of cheques to some of our selected charities - and it's great that we can include all these deserving causes in benefitting from the generosity of the support and participation by the people of Chesterfield. "We hope these cheques will be ever bigger amounts from the 2015 Marathon and on and spread across many more charities in the coming years." 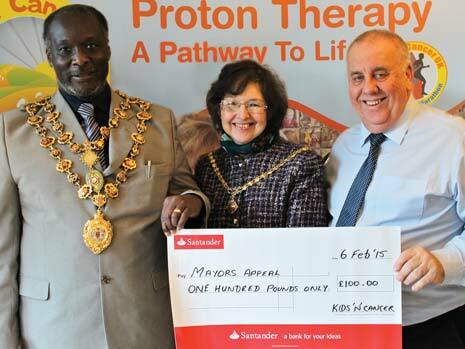 The Mayor of Chesterfield, Cllr Alexis Diouf, was also invited and after receiving a donation to the Mayoral Appeal, said, "Obviously we got a cheque from the Marathon today and every little bit helps. It's great to know the funds were raised by the people of Chesterfield - it just shows how great they are at raising funds for good causes and I'm grateful for the money we got as it will go into the Mayor's Appeal which supports the British Heart Foundation, Friends of Baback and Roofstop. We have just received the cheque and we will be going to put it in the bank!" 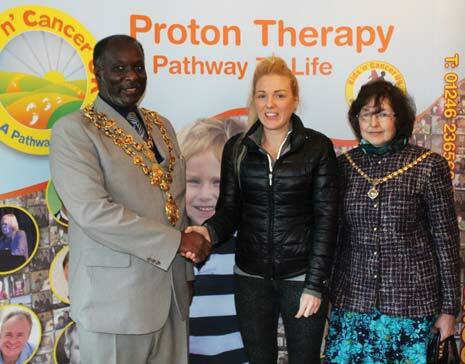 The Mayor and Mayoress also had a chance to meet with Victoria Crampton at the event (above), who is running the gruelling 'Marathon De Sables' in April - Six marathons in Six days in the heat of the Sahara Desert (story HERE) - for which she is hoping to raise £10,000 for Kids 'n' Cancer.